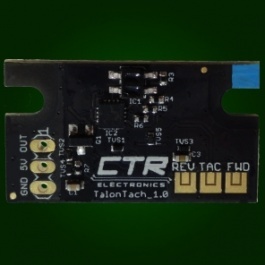 The Talon Tach is a pass through contactless limit switch and tachometer that integrates seamlessly with the Talon SRX motor speed controller. The Talon Tach is a multipurpose reflective sensor with limit switch and tachometer capabilities. An onboard infrared emitter/sensor enables optical detection of a reflective surface, and filtering hardware produces crisp square-wave outputs for repeatable measurement. The Talon Tach integrates dual 10-pin headers to easily interface with the Talon SRX while daisy-chaining other devices such as the SRX Mag Encoder. 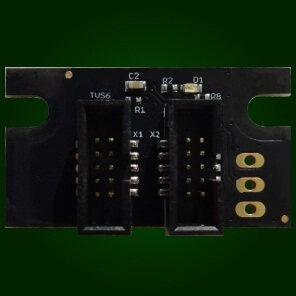 Solder pad mode selectors are bridged to select operation as a forward/reverse limit switch or tachometer, and the onboard 3-pin header can be used to provide a generic output. Please see the User Manual for more information. Aluminum, white paper, mirror, etc.